No more pesky brothers and sisters barging into your room! 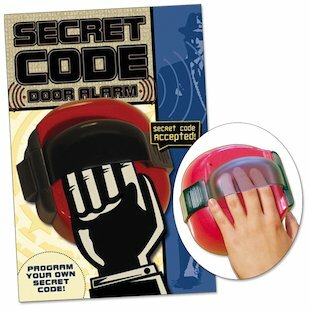 Now you can keep them out with your very own secret code kit. Create a cunning code which will keep that door shut tight – and set off a yowling alarm if anyone shoves through! Yes, that’s right – YOU’RE the only one who can get past the siren. Intruders get it in the neck. So now that you can relax and read in peace, learn all about codes and ciphers with the cool booklet too. Kit contains a 32-page paperback book and a plastic alarm to build, with electronic parts. Requires 2 AAA batteries (not included).